Hey, guys! I just got back from a trip recently. 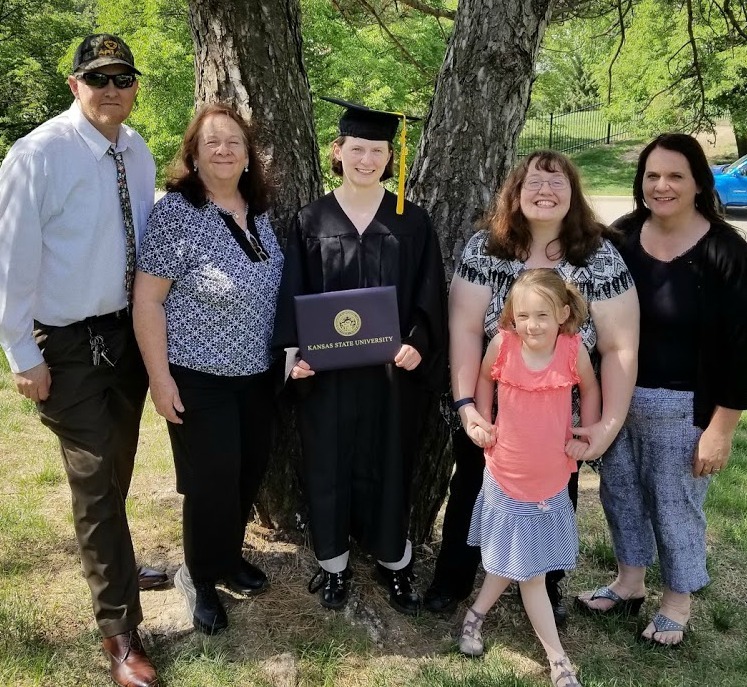 We had a lovely Kansas City vacation to see my family and also went to Manhattan, Kansas, to see one of our daughters graduate from college at Kansas State University. Just for fun I thought I’d share a little bit about our trip with you! My husband and I flew to Kansas City International Airport with our youngest kiddo and we rented a car. We headed to my cousin’s house near Kansas City, which is where we stayed most of the trip. Another one of my cousins and my aunt live near him. My mother and sister also came down from Iowa and stayed at my aunt’s place. It was so great to have everyone together! 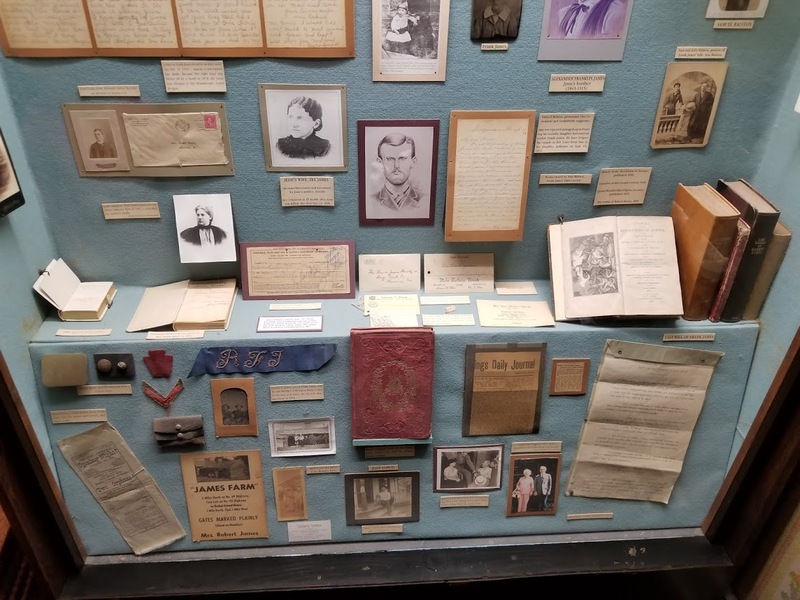 Back in the days before we could electronically send messages to each other in a matter of seconds, “snail mail” through the Post Office was all we had. But imagine if the Post Office wasn’t like it is now…it would take so long to get messages to each other. I can’t even imagine! 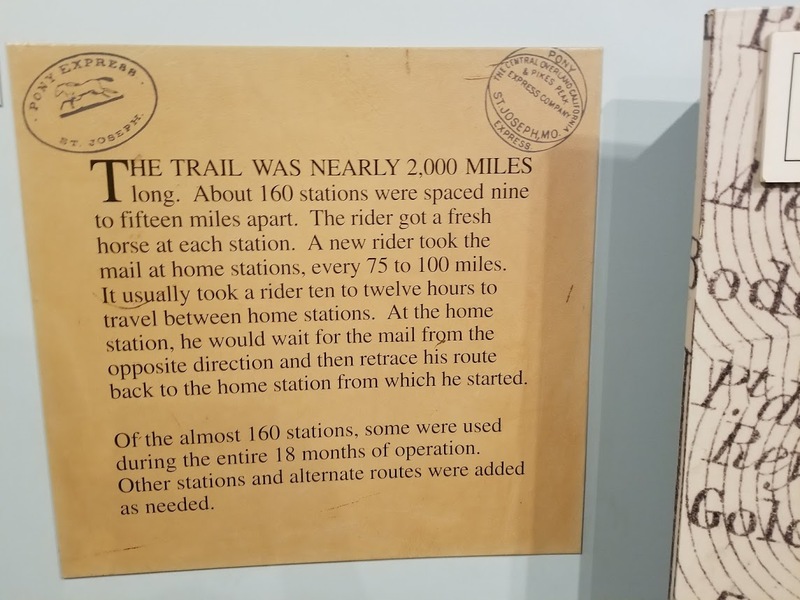 The Pony Express museum showed some cool history of when mail was delivered by horse. 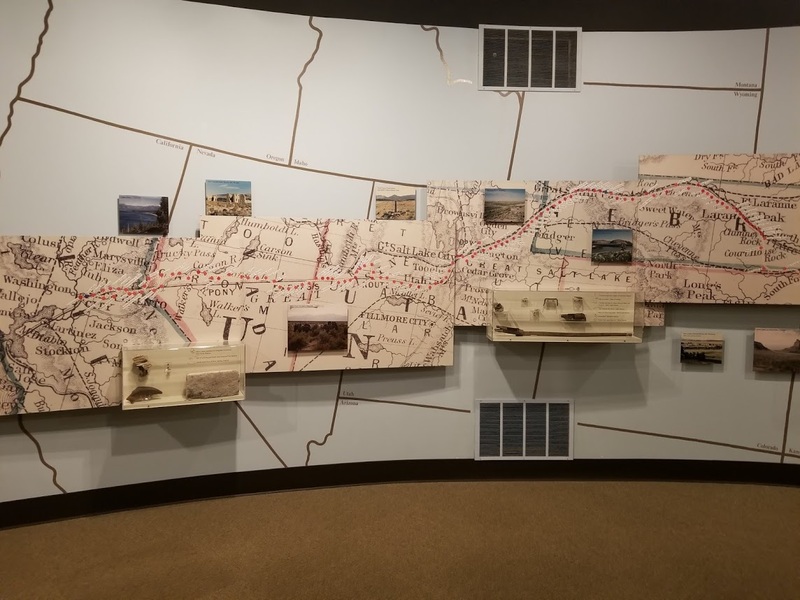 I live in the Salt Lake City area and I did not even know that it was on the Pony Express route. So cool! 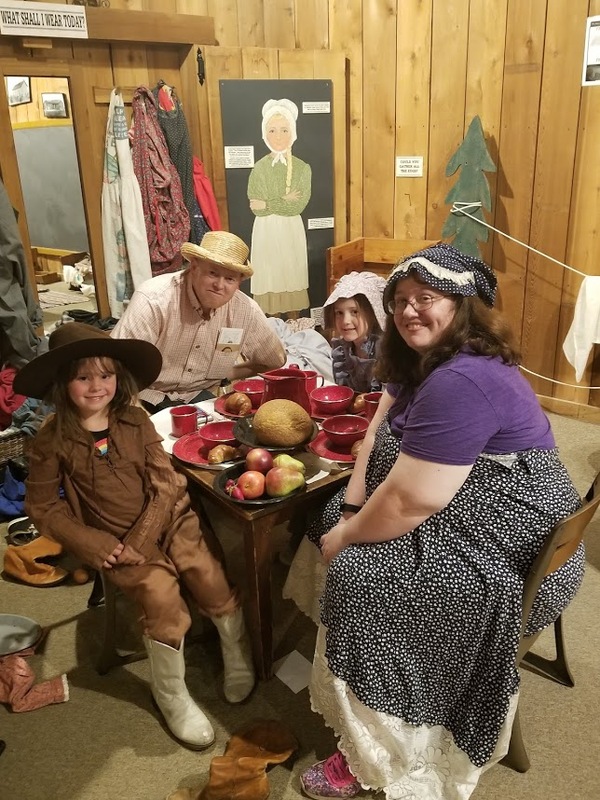 …and it also had an amazing area where you could dress up and pretend to be pioneers! 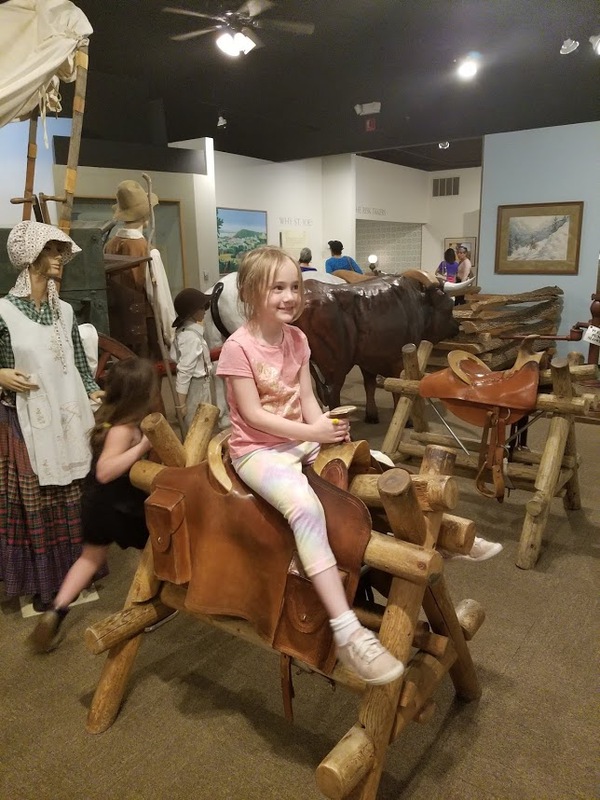 My little one loved it! 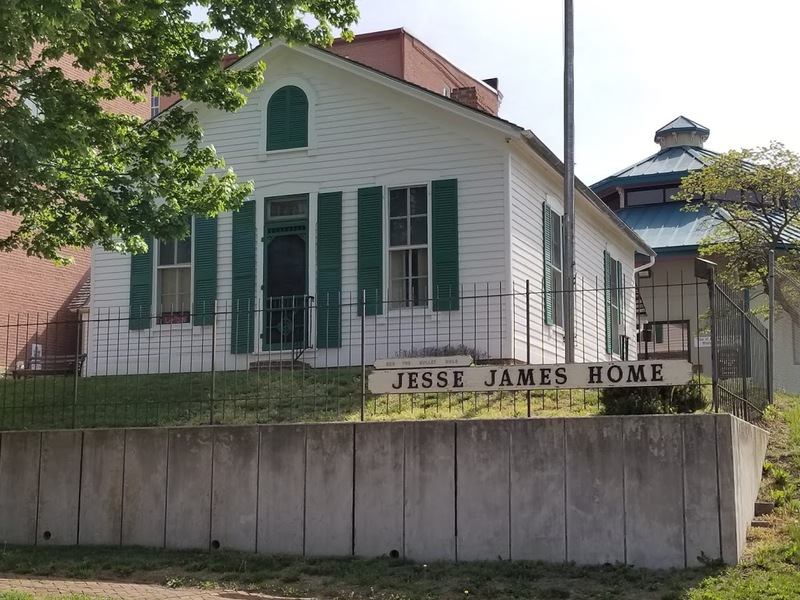 Did you know that when Jesse James hid in this home in St. Joseph, Missouri, he was killed by someone outside when he stood up on a chair in the front parlor to fix a crooked hanging cross-stitch? 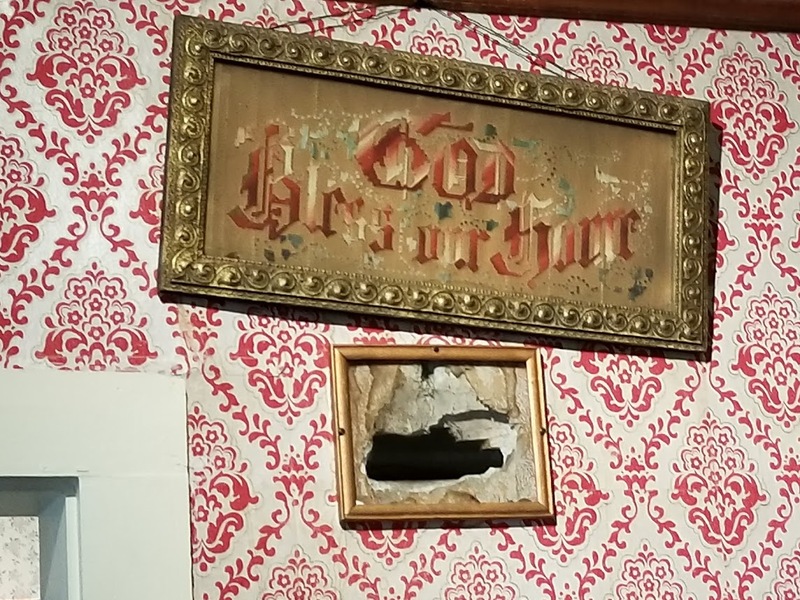 …and this is a bullet hole from when he was shot…right by the crooked cross-stitch! 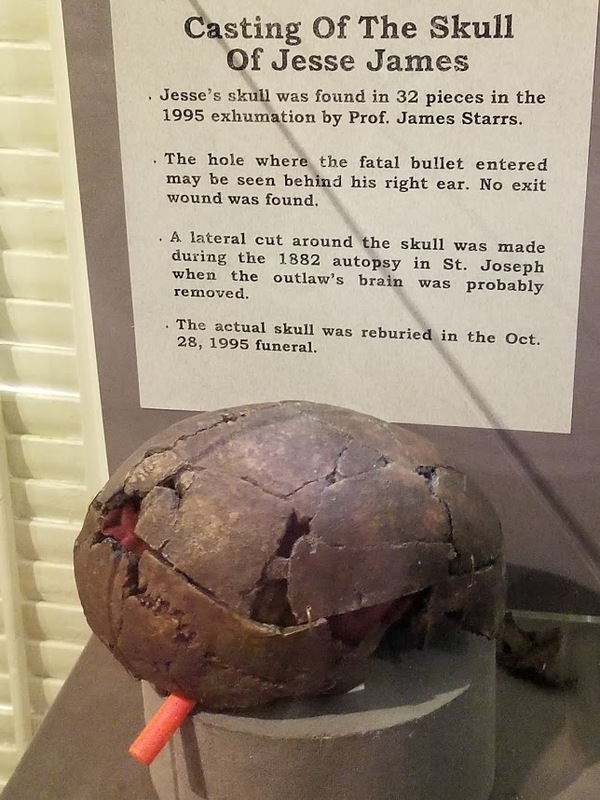 Jesse James body was exhumed and this cast was made of his skull before it was reburied. 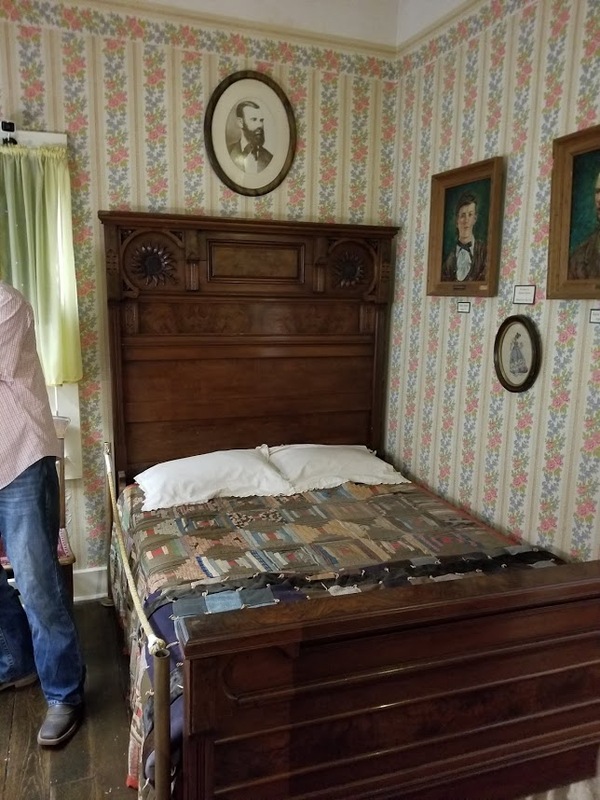 The bedroom in his home (don’t mind my husband partially photo-bombing the picture. The rooms were tiny! 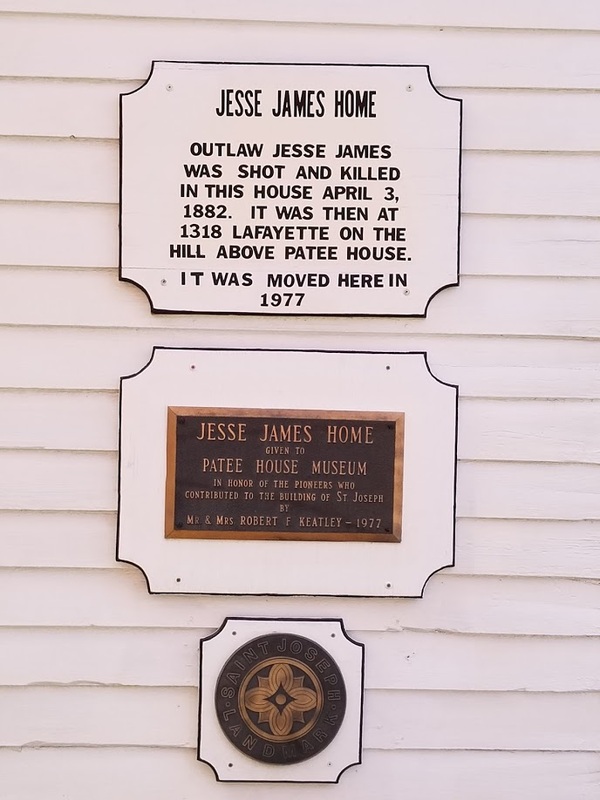 The Patee House Museum had so much cool historical stuff! 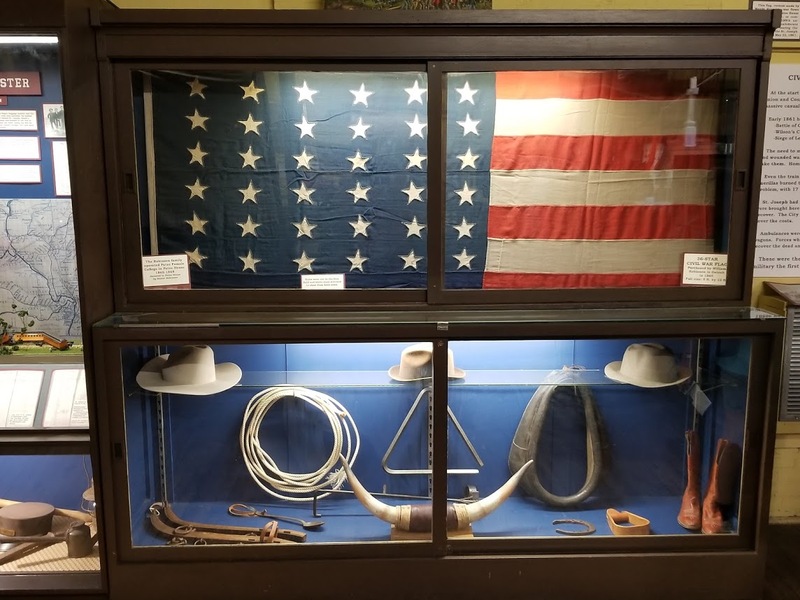 I really liked this American flag. Holes were cut into the blue fabric and then the white stars were sewn in! No flag-making factories back in the day! 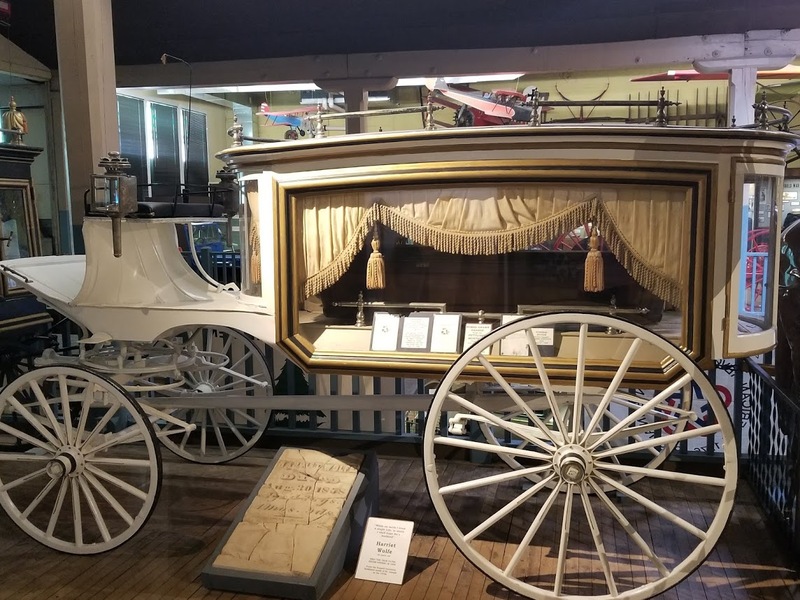 Check out this old-fashioned hearse. So much more classy than a car, don’t you think? 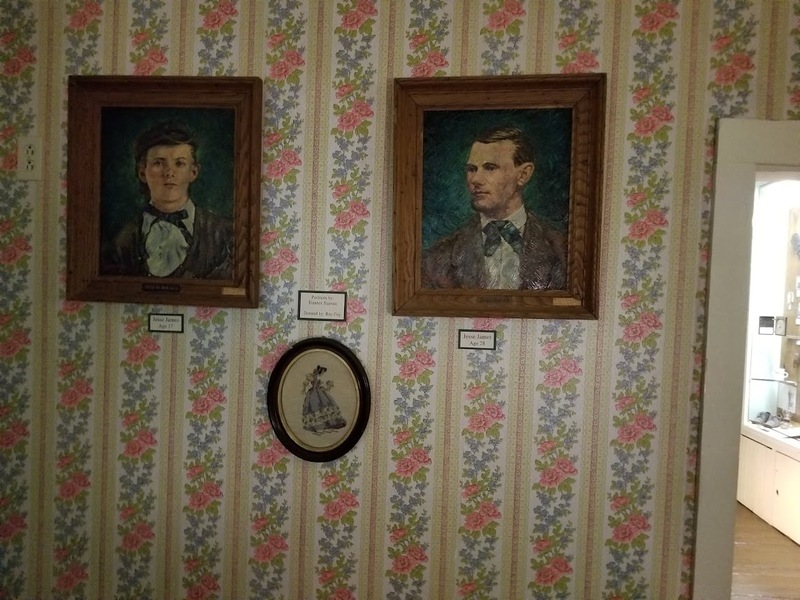 I love how you can see the casket under the decorative curtain. 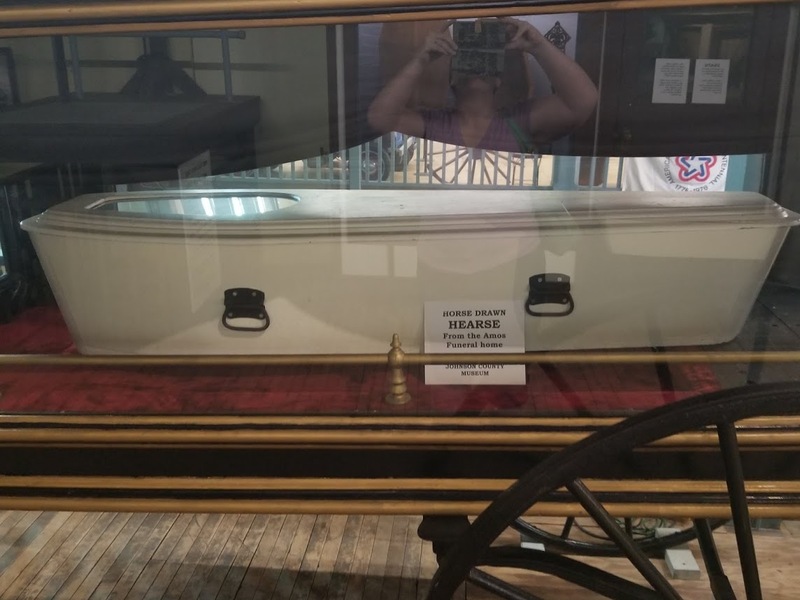 Isn’t it fascinating that they used to have caskets with glass so that you could see the deceased person’s face? 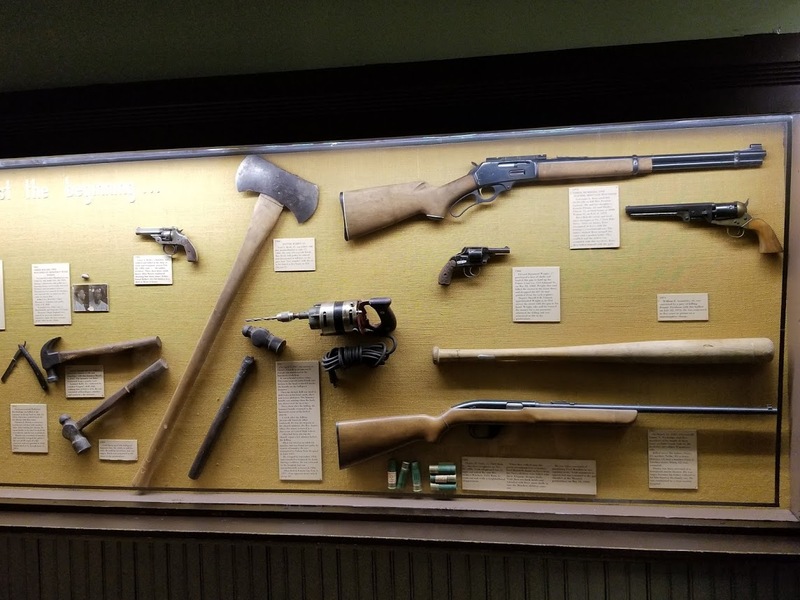 These were weapons used in actual murders! THAT’S a little morbid! The following day we drove to Kansas. 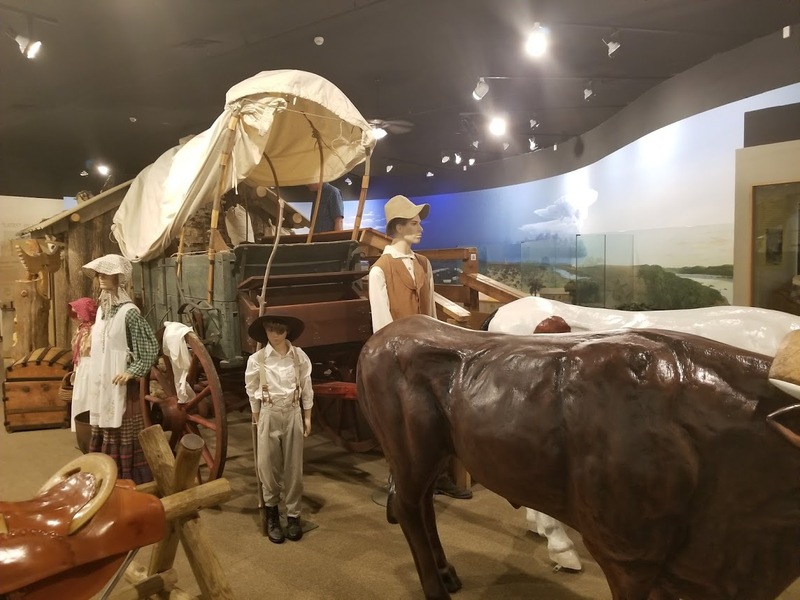 We stayed the night in Junction City, Kansas, because all of the hotels in Manhattan were pretty much full, despite me booking the room months ahead of time. In the morning we woke up bright and early at 6 a.m. to get to graduation in Manhattan, Kansas, at 8:30 in the morning. 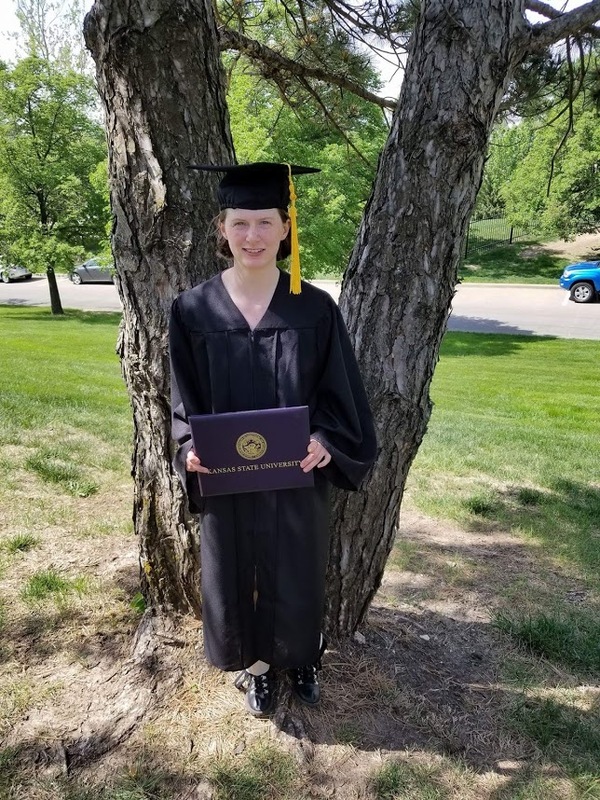 And so my firstborn walked in her cap and gown, graduating with a degree in Biology from Kansas State University. I’m so glad we could go and celebrate with her! 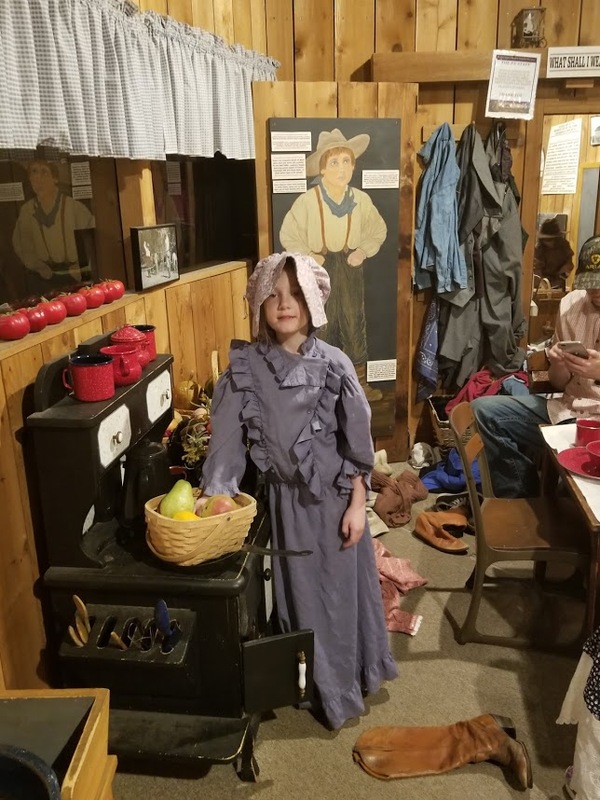 Now that she is done with school, she is interested in conservation. While in school she has been working with an ornithologist (bird expert) at the university on some research. She will be working there still for the summer and while there she will start looking for a permanent job (hopefully closer to home!). 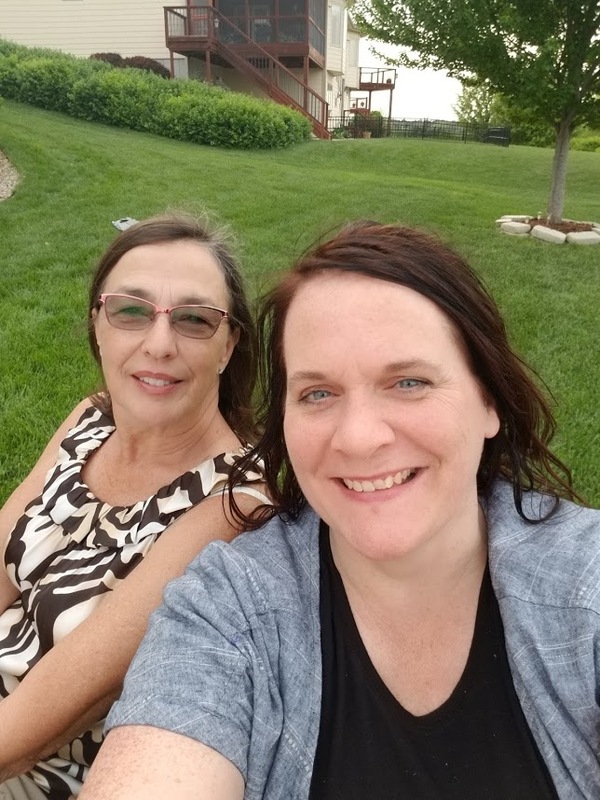 While we were in Manhattan I was able to see my dear friend from when I went to nursing school in Kansas. It was so great to see her again! After the ceremony we headed back to my cousin’s near Kansas City. 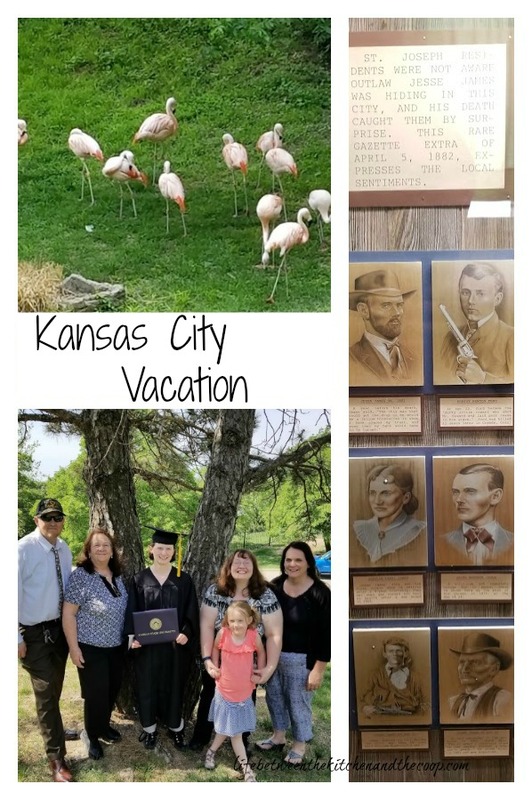 The following morning happened to be Mother’s Day, so we had a big breakfast with all of the family and then spent Mother’s Day at the Kansas City Zoo. 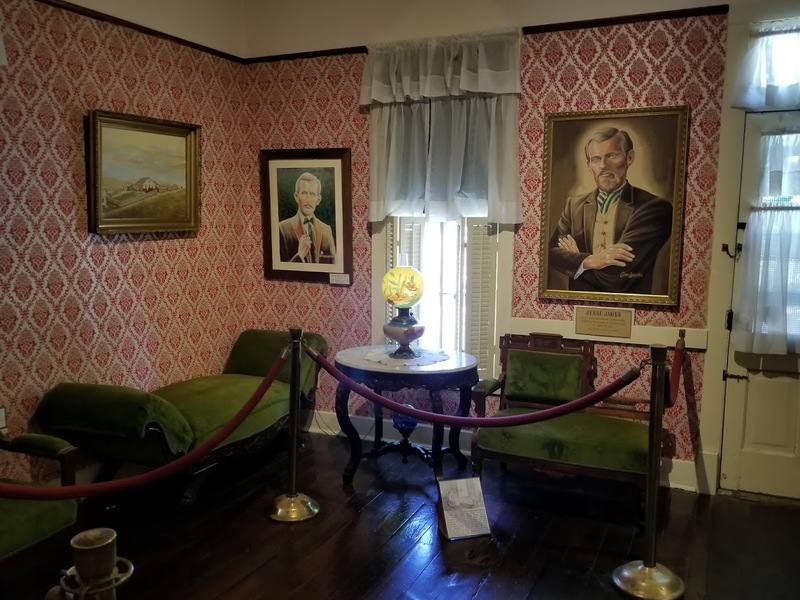 We went there last summer when we were in KC, but we didn’t have time to see everything, so we wanted to go again. The one thing I missed last fall that I definitely wanted to see this time was the penguins, so that was my first stop! They were so fun to watch! 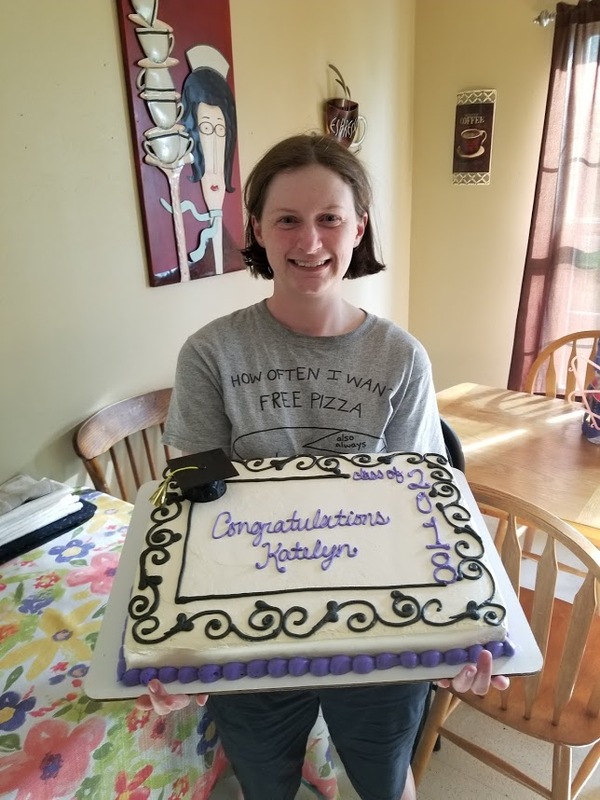 When we got home from the zoo, we had a little graduation party for Katelyn. It was a good time with family and of course there was a yummy cake! After dinner, we had one more exciting thing to look forward to before bedtime. 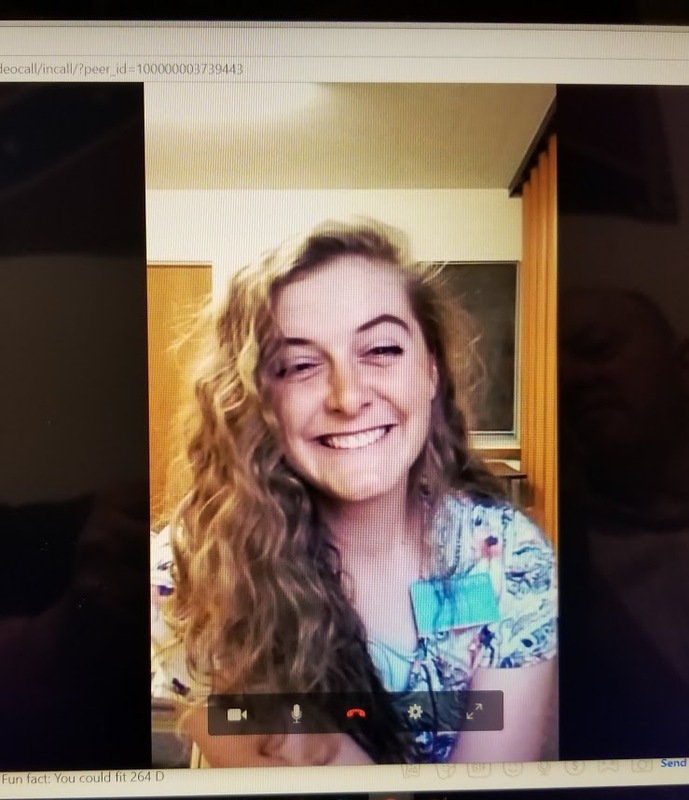 Katelyn’s younger sister, Kira, who is currently serving a mission in Arizona, called via Facebook messenger video to wish me happy Mother’s Day. We haven’t talked to her since Christmas, chatting with her was such a treat for us. We miss her so much. One more year til our missionary gets home! It was a wonderful trip, so fun seeing so much of my family. Sounds like we will be going back next year because it sounds like Amy and Landon are finally gonna tie the knot!